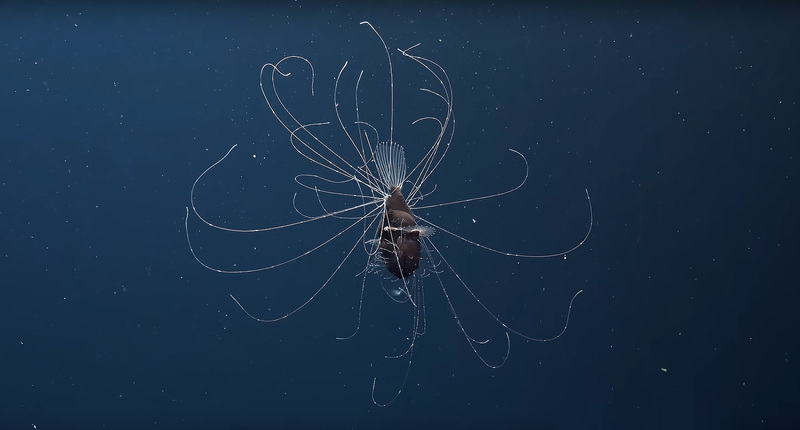 The Rebikoff Foundation has captured amazing in-situ footage of this deep-sea Fanfin Anglerfish and her mate. Science Magazine has published some of the most groundbreaking fish footage ever seen. It depicts a female deep-sea Fanfin Anglerfish (Caulophryne jordani) and her mate like never before. Researchers Kirsten and Joachim Jakobsen encountered the fish at 800 meters (2625 feet, or roughly a half-mile) depth while utilizing the Rebikoff Foundation‘s manned deep-sea submersible, LULA1000. The footage was captured at São Jorge Island in Portugal’s Azores archipeligo in 2016, and was only made public March 22nd, 2018. Watch the stunning footage below, and learn more about the discovery at Science Magazine.